Our carefully designed and decorated rooms in modern Thai style will give guests the full sensation of warmth, comfort and relaxation. 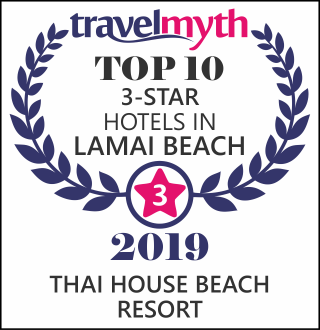 Deluxe Family Triple Located on Thai House Main Building, the bedroom is large enough for a modern family lifestyle or guests may request for a connecting room. Deluxe Family Double Located on Thai House Main Building, the bedroom is large enough for a modern family lifestyle or guests may request for a connecting room. Each of these ground floor villas designed to offer guests the ultimate in privacy. The villa is situated on the first row from the stunning beach. The southern third of the beach has the widest strip of sand... read more. The charming Thai-style resort is the perfect place to spend a memorable holiday experience. read more. Dining at Thai House Beach Resort is a memorable experience. Guests can savor fresh seafood read more. tastes and romantic requirements, read more. of excellent facilities and services read more.